It was reported a couple of months ago that Aishwarya Rai and Abhishek Bachchan were no longer going out together but recently the two made a couple of public appearances together in Chennai where they are shooting for Mani Ratnam's Guru . They were seen together at the cancer ward of a local hospital where they spent time with the children. They were also spotted together in a cinemas in Chennai, where they watched Mission Impossible 3 and X-Men III back-to-back. The couple were also spotted partying at a nightclub and dancing to their hit song from Bunty Aur Babli , Kajra Re. Rangeela girl Urmila Matondkar has been confirmed by Ram Gopal Varma to star in his next film Badla , which he plans to start shooting before undertaking his remake of Sholay . Urmila Matondkar has also been assigned to play an item number in the remake of Sholay . Rumors have it that Ramu has assigned Urmila Matondkar to play the character of Helen who danced in the original Sholay on the song Mehbooba O Mehbooba… which will be sung by Himesh Reshammiya . Hrithik Roshan to make a guest appearance in the first home production of Arjun Rampal titled I See You . The movie will be directed Vivek Agarwal and will be shot in London. Minissha Lamba will be seen opposite Arsha Warsi in Anthony Kaun Hai . She made her filmi career debut Yahaan last year. Neha Dhupia has been signed by Rajat Kapoor’s for his upcoming film titled Mithiya to play opposite Naseeruddin Shah. Neha Dhupia will play the role of a mole for a gangster in the film. Neha Dhupia has also been signed by Apoorva Lakhia’s as a replacement for Urmila Matondkar role in Shootout At Lokhandwala to play Sanjay Dutt ’s wife in the movie. Sanjay Gupta has also signed Neha Dhupia for Dus Kahaniyan . Mallika Sherawat to be in a movie with Rahul Bose. She will be playing a role of a strong, sensuous and independent woman in a romantic comedy called Pyaar Ke Side Effects . Rumors have it that Sophie Choudhary will be performaing an item number in the movie. Priyanka Chopra will play a role of a singer in Raj Kumar Santoshi’s London Dreams which is scheduled to release in 2007. Ajay Devgan and Salman Khan are in the lead and music is composed by A.R. Rehman. Indian animation filmmaker Gitanjali Rao's Printed Rainbow bagged three awards at the International Critics week, a day before Cannes came to a close. Her 15-minute long animation film Printed Rainbow got standing ovations at all the seven screenings. Celina Jaitley is currently busy shooting for of Vikram Bhatt's Red. She was busy the last two months with her overseas Heat World Tour. She has been given a role of a lifetime in the movie. Sushmita Sen will next been seen in Karma, Confessions and Holi . Karma, Confessions and Holi happens to be the first Bollywood and Hollywood joint production with mainstream stars from both the film industry. Sushmita Sen , Randeep Hooda, Deepal Shaw and Suchitra Krishnamoorthi represent Bollywood while Drena De Niro world renowned supermodel and actress Naomi Campbell represent Hollywood . The movie will also feature a steamy shower scene between Sushmita Sen and Randeep Hooda follows with a smooches. This will mark the first kissing scene for Sushmita Sen , the other was with Anuj Sahney in Chingari , but was later edited out. The movie's format reminds of Mira Nair's internationally acclaimed Monsoon Wedding with different stories of different people converge together on a marriage setting. Aishwarya Rai became the first Bollywood star to leave her handprint on the Dubai Studio City's Hall of Fame during the film festival this year. Remember last year she was honoured with a Tulip named after her in Amsterdam. She has being called the most beautiful woman in the world with more than 17,000 websites dedicated to her name. Sonali Bendre has been signed by Marico to endorse their baby products under the brand name Sparsh. This would mark a comeback into the limelight after her marriage to filmmaker Goldie Behl and taking care of their ten month old baby boy named Ranbeer. The music for the most awaited movie of the year, Kabhi Alvida Naa Kehna (KANK) , will be launched at the I.I.F.A. weekend, on June 16. Karan along with Amitabh Bachchan , Abhishek Bachchan and Rani Mukherjee will be present to launch the music. Rani Mukherjee is also in the news since she recently signed up as the brand ambassador for Titan Raga, a watch brand which is designed and crafted exclusively for women. Madhuri Dixit , the Dhak Dhak girl, who currently resides in US with her husband, NRI Dr Nene, and her two children was recently honored on her birthday with a calendar providing her glimpses. Lisa Ray may play a lesbian character in Can’t Think Straight being directed by Shamim Sarif. Other films that have tackeled controversial themes are Girlfriend and My Brother Nikhil. Bollywood comes out to help social causes. The stars from the film industry recently showed their support for AIDS awareness program by launching a music album Haath Se Haath Milaa, named after the awareness program. With music from Shankar, Ehsaan and Loy and lyrics are by Javed Akhtar. The songs are sung by Sonu Nigam and Shreya Ghoshal and features 50 Bollywood stars and TV actors including John Abraham , Bipasha Basu , Shilpa Shetty , Fardeen Khan, Tabu and Lara Dutta . Desi version of Sesame Street ropes in Bollywood stars like Amjad Ali Khan, Rahul Bose, Sivamani, Neha Dhupia and Daler Mehndi. The Indian version will be named Galli Galli Sim Sim and have four lovable muppets, named Chamki, Aanchoo, Googly and Boombah. The show will be shown on Cartoon Network and POGO. Priyanka Chopra and Akshaye Khanna will be seen in Aap Ki Khatir being directed by Dharmesh Darshan. The film is currently in post production and is scheduled for release in the next 2 months. This will mark the first time Priyanka Chopra and Akshaye Khanna has starred in a movie together and the rumors have it that they have a great sizzling chemistry on screen. Other stars include Amisha Patel , Dino Morea , Suniel Shetty and Anupam Kher and the music is being provided by the hottest music director Himesh Reshammiya . Bipasha Basu for first time in her career will be playing double role in the Abbas-Mustan’s next untitled currently being shot in London. The comedy film also stars Ajay Devgan and Sanjay Dutt . Amitabh Bachchan has just finished shooting for Ram Gopal Varma's Nishabd with Revathy, Rukhsar, Jiah Khan and Aftab Shivdasani. The film is scheduled for a September release. 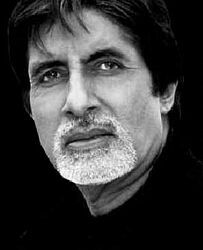 Amitabh Bachchan will also be starring in Balakrishnan's Chini Kum opposite Tabu . The movie has Amitabh Bachchan flirting with a much younger Tabu . The movie will be shot in London, Delhi and Mumbai. Sameera Reddy will become the first Indian actress to be featured in a video game. Sameera will be shown as a warrior princess who fights savage warriors in a game designed for mobile phones. The game resolves around ancient Indian city where she fights the tribes trying to attack her father’s kingdom, which may lead Sameera to become the Indian Lara Croft. Fanaah to be now seen in Gujarat. After making big headlines for the past month Fanaah now will be allowed to be shown in Gujarat as ordered by the Supreme Court. Abhishek Bachchan will endorse Motorola in India. He was officially declared as the Motostar for Motorola cell phones. He has also endorsed Ford Fiesta and LG in the past and is currently shooting for Mani Ratnam’s Guru . His next big release include Dhoom 2 , Kabhi Alvida Na Kehna (KANK) and Umrao Jaan . Bollywood stars and their pets. Shahrukh Khan has 2 dogs named Chewbecca and Rebecca. Salman Khan has two French mastiffs, Myson and Myjaan. Arjun Rampal dogs are named Tyson and Demi. Bipasha Basu has dogs named Chihuahua, Poshto. Aishwarya Rai has a huge female dog boxer named Sunshine. Hrithik Roshan who has a cat named Pearl. Sameera Reddy has turtles as pets. Ram Gopal Verma has decided to shelve his forthcoming film Time Machine which stared Shahrukh Khan and instead decided to start work on the remake of Sholay . It was also announced that Himesh Reshammiya , currently the hottest music director turned singer, who will be providing the music for the movie will also be singing the famous Mehbooba Mehbooba for the film. The film stars Amitabh Bachchan as Gabbar Singh and Urmila Matondkar will dance to Mehbooba Mehbooba. Bipasha Basu is currently shooting for her next release, Phir Hera Pheri Phir Hera Pheri. Her next assignment will be a Bangla movie with her favorite director Rituparno Ghosh, called Draupadi , which is scheduled for release in 2007. Also in the news is that John Abraham has reiterated that he would marry with no one else but Bipasha Basu . Controversy over Aamir Khan 's comments still keeping Fanaah from Gujarat. Now the local in small towns are withdrawing commercials and posters with Aamir's name. In Ahmedabad and Vadodra car dealers of Totyota cars have decided to withdraw Aamir Khan 's ad posters promoting the brand's Inovo car. To promote the film, Yash Raj Films has has introduced an array of collector's items like stainless steel cup and saucer, and a chilli pendant called "Mirchi Fanaa pendant". Priyanka Chopra to star in Chamki Chameli directed by Shyam Benegal. The same role was first offered to Kareena Kapoor and then Urmila Matondkar . Malaika Arora Khan 's has been signed by an European cellular phone vendor to be the brand ambassador to launch their three Meridien mobile phones.